LSB and I were parked in front of the TV the other night watching the film Trainwreck with Amy Schumer. It’s bold and outrageous, just don’t watch it with your mammy beside you as she’ll turn all shades of puce. 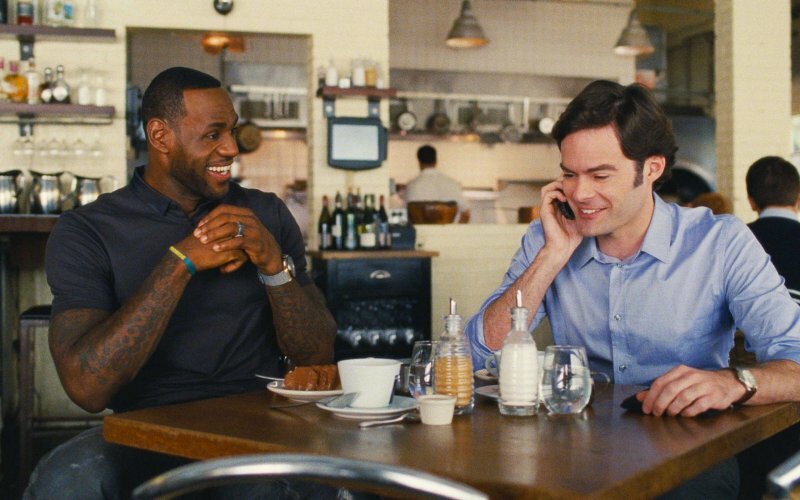 The scenes which tickled me in particular were those starring LeBron James. Of course I didn’t know who it was. “Should I know who that really tall fella is?” I asked LSB. “You should, but you won’t, of course,” he replied, going on to explain that he’s possibly the most famous basketball player in the world and plays a kind of caricature of himself in this movie. Apparently he’s unerringly generous in real-life but he’s portrayed in the film as being exceptionally tight, whipping out the calculator app on his phone to divide up who-ate-what for lunch, and driving across town to pick up a pair of cheap sunglasses he’s left behind. He’s a multi millionaire NBA star and in one scene he’s frantically patting his pockets to find he’s forgotten his wallet so his best friend has to cough up for the bill. Well this made me think of all the excruciating times I’d been out with friends or colleagues and the waiter brought the bill and a terrible hush had descended and all bonhomie was long gone in case some one was diddled out of a pound. I have to admit, if some of these individuals had done a Lebron James and got their calculator out, I’d have been so relieved they were actually going to pay AT ALL that I might have broken into applause. If there’s one thing I can’t bear, it’s a bill dodger. A friend of mine went on a charity bike race which involved travelling with a group of people they didn’t know. Arriving in Vienna late one evening, they found themselves in the only restaurant that could squeeze them in, but was considerably more expensive than they had anticipated. However, since they were tired and half-starved, in they went and were busy ordering the moules frites or pasta special to keep the cost down. All of them, that is, except for Mervyn, who’s getting wired into the filet steak and chips and orders a fine bottle of red. And you’ve guessed it, when the bill comes, there’s not a mention that his meal cost double everyone else’s. He had the audacity to do the same the following evening, but by the third night the party broke up. People went off in twos and threes and so sickened were they by his stinginess, that the whole trip felt a bit flat by the end, and the fizz went clean out of the celebration. A lack of generosity never makes anyone feel good, but the person with whom we are often the least magnanimous is ourselves. I could self-flagellate for Ireland. I’ll torture myself over a misplaced apostrophe or a spelling mistake in something I’ve fired out into the ‘cloud’ to torment me for all eternity. I won’t give myself any credit for the fact that I’m finally writing after many years of wanting to, but not having the balls to start. Instead, I’ll berate myself whole-heartedly for what I got wrong. It’s not just me either; it’s a human thing, or more specifically, a woman thing. We seem hot-wired to sabotage our own happiness, or contentment. Now please, don’t misunderstand me. I’m not saying that we shouldn’t expect the best from ourselves and go all Californian and clap ourselves on the back saying “Good work buddy!” for writing some shite or buying someone a coffee. But a little self–love can go a long way. Years ago I had a friend for whom stinginess was a life choice. She would never miss an opportunity to avoid paying for a round or weaselling a drink or a meal out of the rest of us. If one foolishly acquiesced and paid her way she’d accept the drink smugly with an expression which said clearly “Sucker! Got them again!” And this lack of generosity wasn’t limited to money either. We were friends for a long time, and I don’t think she ever, knowingly, paid me a compliment. What she did have, however, was a forensic memory for any past indiscretions, or moments when you weren’t your best self. I’d be sitting, a forkful of curry raised to my lips and all smiles she’d say: “Do you remember the time when you….” and zoom in on some shame inducing moment from our student days, and parade it for public consumption. I’d feel a hot rush start at in my cheeks and flame down my neck until I was aglow with mortification. Thus discombobulated I’d probably be duped into paying twice what I owed in an effort to scarper, and dampen my embarrassment with a bottle of wine. We’re not friends anymore. Life is busy and emotionally taxing enough without hanging out with people who make me feel small. I ignore friend requests on Facebook from people if I have no desire to meet up in person. Maintaining a friendship requires effort, but if you care for the person you shouldn’t have to think of ways to manage the situation, figuring out ways of protecting your time, your emotions or your wallet. A good requirement in a friend, especially one whom you’ve known from school or university, is a big heart and a short memory. It would have saved me much aggravation if I’d worked that out sooner.